Unlike Americans, Romanian citizens abroad can’t send in an absentee voting ballot through the mail. They need to vote in-person at a facility approved by Romania’s Ministry of Foreign Affairs, the division of government that organizes diaspora voting. During the first and second rounds of the Romanian Presidential Election, which took place this past November 2nd and 16th respectively, Romanians in the U.S. voted at Consulates in major cities, the Embassy in D.C., and various schools and halls in all corners of the country. Poland, Russia, Ukraine, and Moldova have similar requirements for its citizens who want to vote outside of the country. The rules are pretty straightforward. Voting can only happen on Election Day, and it must take place at an approved polling station. If you’re busy that day, or can’t commute to a polling station, you don’t get to vote. Under the mail-in system, people have a more generous timeframe to send in their ballots. In addition to the U.S., Canada, Germany, Indonesia, Thailand, and Britain allow mail-in voting. Mexico allows it as well, since 2005. In Britain, voting can even be done through proxy: one countryman can designate another to vote for him! Roughly 3 million Romanian citizens live outside of Romania. That’s enough people to swing the election, which was decided by only 1 million votes. The diaspora leaned heavily toward Iohannis, who was viewed as progressive, anti-corruption, and someone who would nurture Romania’s relationship with Western Europe. 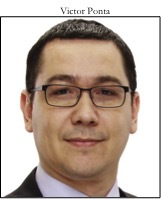 Ponta, on the other hand, was seen by the diaspora as traditional, old-guard, and unable to inspire the sense of progress and transparency that Romanians crave. Ponta actually had the most votes during the election’s first round on November 2. He got 40%, but needed at least 50% to win. Iohannis was the runner-up at 30%, and the remaining 30% was divided between twelve other candidates from a variety of political parties, including the Romanian Ecologist Party (.45%) and the Democratic Union of Hungarians in Romania (3.47%). Since no candidate won the majority, the election went into a final round between the top two on November 16. The map below shows results by locality during the first round. 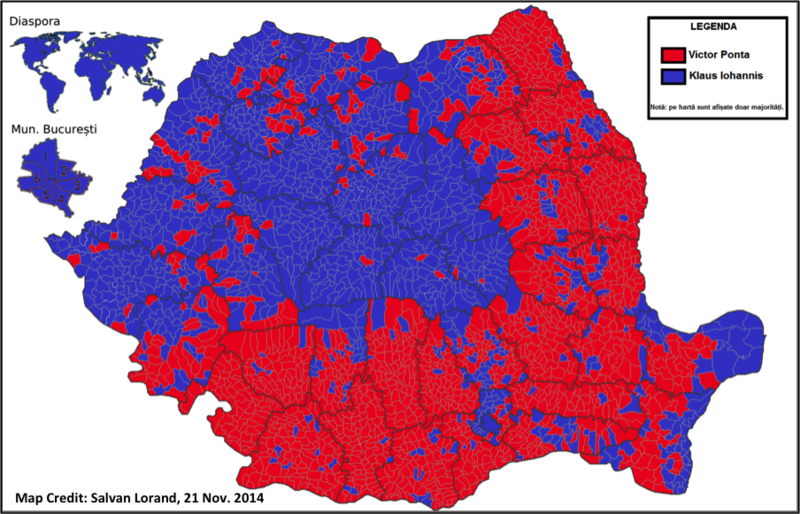 Iohannis, blue, was clearly favored by the diaspora, and also in his home region Transylvania in the northwest of the country. Sibiu, the city where he was born and served as mayor since 2000, is located more-or-less at the crosshairs on the frame of the map. Ponta was favored in the three other major regions of the country: Muntenia, south, which includes Bucharest; Moldavia, northeast; and Dobruja, southeast. Below is another map showing the election’s second round results. Ponta maintained a sizeable support in Muntenia, Moldavia, and Dobruja, but more localities within those regions voted Iohannis. 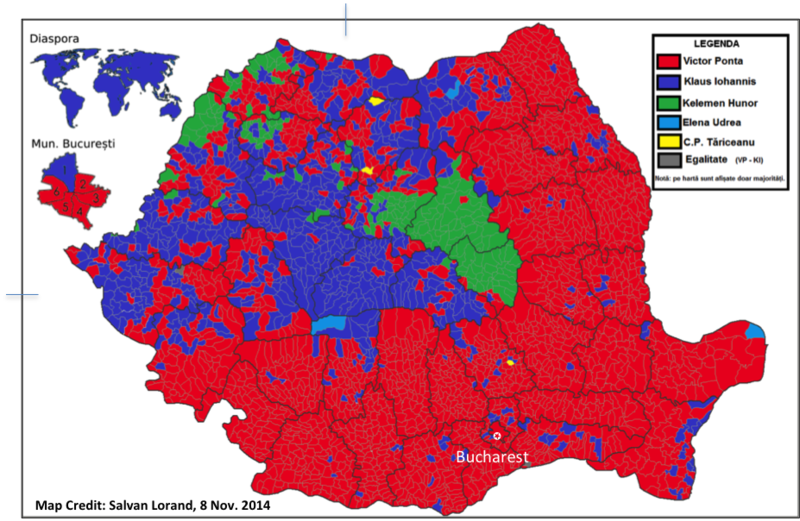 Bucharest went from supporting Iohannis in only one municipality to all six in the second round. In addition, almost every locale that supported a third party candidate in the first round voted Iohannis in the second. In Chicagoland, Romanians either voted at a school in Niles, IL or at the Romanian Consulate downtown. Chicagoland was the only metropolitan region in the U.S. where two polling stations were located. Madrid and Brussels had four polling stations, more than any other city. Italy had a total of fifty-one for the more than 800,000 Romanian citizens living there. Khartoum, Sudan; Abuja, Nigeria; and Colombo, Sri Lanka all had a Romanian Embassy where voting was possible. Surprisingly, there were even two polling stations in Kabul, Afghanistan where there’s a sizeable Romanian military presence. Yes, the diaspora is widespread. In major Western European cities, as well as in Chicagoland, the government’s organization of polling stations was seen mostly as a disappointment. That being said, it must have been a logistics-headache to staff and manage every polling station: there were more than 200 outside of Romania. Many were quick to blame Prime Minister Ponta, aware of the diaspora’s dismal support for him, for purposefully making polling stations inefficient. 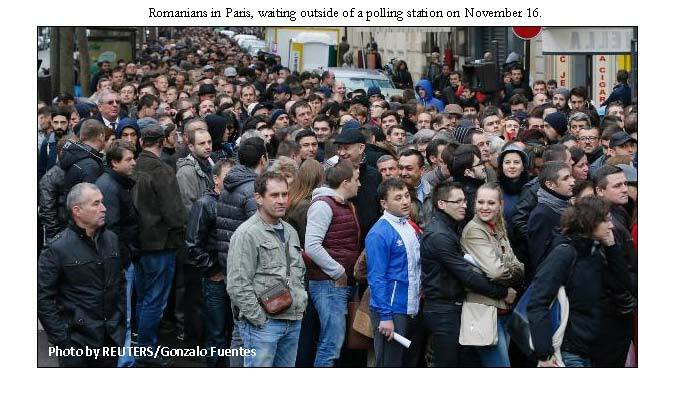 In cities like London and Paris, thousands lost the chance to vote because time ran out while they were still waiting in line. Since voting could only take place on Election Day, there was nothing they could do. Others were discouraged from waiting in the first place. I witnessed voting at the station in Niles, IL. The parking lot, similar in size to a suburban grocery store’s, was jam-packed. Volunteers were directing traffic, telling drivers to go to a neighboring parking lot, because there was no room left. Some people, in all the madness, invented their own parking spots by going on the grass, for example. I saw tens of would-be voters turn back to their cars, deciding it wasn’t worth standing gridlocked in line. Those who waited looked understandably tired and impatient, yet they stood dedicatedly. Upon reaching the voting area, people presented their passports, a form, and then stamped the name of their desired candidate in front of a government official. Despite the crowd of hundreds, only four stamps were in use. Iohannis was sworn into office on December 22, 2014. His job lasts five years, and in 2019 he will have the chance to serve a second and final term.